Pond Logic Pond Dye Quarts shades and protects your pond while enhancing natural color and beauty. 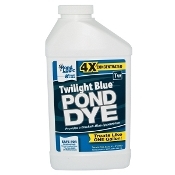 Its powerful 4x concentrated formula allows each quart of Pond Logic Pond Dye to treat like a gallon of competitive brands. Pond Logic Pond Dye 4x Concentrated Quarts are available in 3 colors; each with its own unique application. 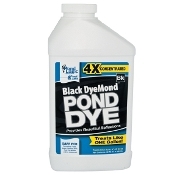 One quart of our powerful 4x concentrated Pond Dye treats like a gallon of other leading regular strength pond dyes making it extremely cost effective; saving you both money and shelf space.While we provide color recommendations below, each color of Pond Logic Pond Dye Quarts provide the same reliable protection and can be selected based on your personal color preference. 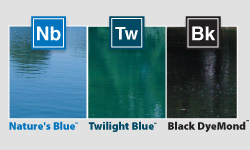 •Twilight Blue maintains a neutral blackish-blue tint that is ideal for shading and protecting your pond without making drastic changes to natural pond coloring. 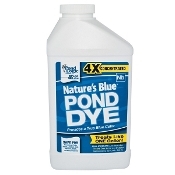 When used in accordance with label directions Pond Logic Pond Dye is completely safe for your fish, plants, pets and pond wildlife.